This article is well worth the time taken to read as it looks at where your city lies within the cost of living rankings worldwide. International cost of living rankings are the result of comparing the cost of an expatriate’s personal budget, using the local prices for the same defined quantities of the same goods and services in each country throughout the world. Our findings show that the compound impact of the multifaceted global economic trends that impact each country in one way or another, are contributing to rapid substantial changes in the relative cost of living of countries around the world. The changes in relative cost of living are large and have occurred in a relatively short period of time. The reason for this is due to the fact that so many economic crises are occurring simultaneously. 2008 saw the housing bubble burst followed by the failure of a number of global fund / asset management, insurance and banking giants. Some have been liquidated or taken over; others have been bailed out with government funds. In 2009 we have seen the continued fall in house prices which many believe have yet to bottom out. Stock prices and market indexes are down to levels last seen a decade or more ago. The trend towards decreased inflation and lower interest rates continues in developed and developing markets. We are also experiencing exchange rate volatility with a number of large economies seeing their currency weaken considerably in the past year. The economic impact is continuing to spread around the globe. We are currently seeing a truly global recession with reduced demand for manufacturing inputs and outputs as well as reduced energy demand and large scale job losses. This study of 276 global locations covered every country in the world. The study comprised the cost of several hundred items that expatriates typically spend their pay on, grouped into 13 Basket Groups. The findings as at 1 April 2009 have been compared to the previous findings of 1 December 2008. The Index uses New York as the base (New York = 100). An index greater than 100, means that the cost of living is higher than New York, an index less than 100, means that the cost of living is lower than New York. Geneva has a cost of living index of 110 for example. That means that on average, goods and services that cost $100 in New York, cost $110 in Geneva. Each city is ranked according to their overall cost of living index which includes the cost of all basket groups. A cost of living index increases or decreases based on the local price of the goods and services used in the study and the ruling exchange rate. As a general principle, a country with a currency that has increased against other currencies (stronger currency) and which has relatively high local inflation (rapid/large price increases), will generally experience an increase in cost of living compared to other countries. On the other hand, a country with a currency that has decreased against other currencies (weaker currency) and which has relatively low local inflation will generally experience a decrease in cost of living compared to other countries. It is important to note that we are talking about relative changes. Take London as another example. As recently as December 2008, London was still ranked the 6th most expensive place in the world for expatriates to live. 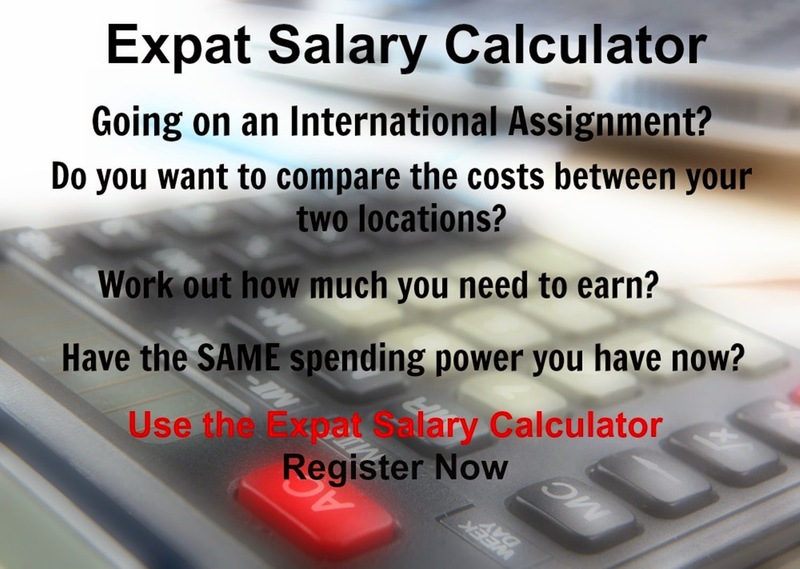 As at April 2009 it is the 23rd most expensive place in the world for expatriates. That does not mean that the local cost of living for expatriates living in London has decreased. What it does mean is that relative to other places in the world, London is no longer as expensive as it was last year. What makes London’s cost of living relatively lower than it was is mainly due to the increase in the cost of living elsewhere together with the weaker British Pound. These relative changes have a substantial impact on expatriate employees. An expatriate working in a high cost of living - strong currency country such as Hong Kong where the Hong Kong Dollar is pegged to the US Dollar illustrates this point. The high cost of living makes it difficult to save due to high local prices; Household (Accommodation including utilities) in particular is very expensive. However, an expatriate working in Hong Kong will now likely find that remitting money back home provides greatly increased spending power at home. In the past year the Hong Kong Dollar has increased 15% against the Malaysian Ringgit, and 30% against the Indonesian Rupiah and the Australian Dollar. Tokyo has retained its status as the most expensive city in the world for expatriates to live. The cost of living index for Tokyo has increased from 126 in December 2008 to 143 as at 1 April 2009, and the Yen has strengthened against the US Dollar. At the other end of the scale, Harare has retained its status as the least expensive city in the world and is ranked 276 with an index of just 17 and a currency which is still in free-fall. Tokyo is ranked 1st for Healthcare expenses, 2nd for Groceries and 2nd for Household (Accommodation including utilities). Hong Kong is now ranked 2nd overall having climbed from 33rd place in December 2008. Its cost of living index has increased from 103 to 121 and is ranked 1st for Household expenses and 2nd for Healthcare. It is interesting however to note that Hong Kong is not expensive in all categories. It is ranked 202nd for Alcohol & Tobacco, 226th for Recreation & Culture, 227th for Education, and 247th for Furniture & Appliances. Lagos is the 3rd most expensive city in the world for expatriates, having previously been ranked 11th. It is ranked 1st for Groceries and for Furniture & Appliance expenses, 6th for Healthcare, and 18th for Restaurants, Meals Out and Hotels. Caracas has moved substantially up the rankings to 4th, having been ranked just 32nd in December 2008. It is ranked 1st for Education expenses, 5th for Healthcare, and 6th for Household expenses (Accommodation including utilities). Port Moresby in Papua New Guinea is the 5th ranked overall most expensive city for expatriates due to most goods and services being imported from Australia. Port Moresby is ranked 6th for Recreation & Culture, 7th for Communication and for Healthcare, and 8th most expensive for Clothing. Geneva has dropped slightly to 6th, having been ranked 4th in December 2008. It is ranked 3rd most expensive for Transport expenses, 11th for Recreation & Culture, 15th for Healthcare, and 20th for Clothing. Dubai has moved into the top 10 most expensive places in the world for expatriates to live for the first time. Dubai is now ranked 7th, substantially up from 34th in December 2008. Its cost of living index has increased from 103 to 109 since December 2008. It is ranked 1st for Restaurants Meals Out and Hotel expenses, 6th for Clothing, 11th for Healthcare, and 16th for Groceries. Dubai is currently ranked 4th for Household expenses (Accommodation including utilities), however evidence is emerging that this will decrease significantly in the next quarter as it has been hit relatively hard in the property sector with falling property prices and rentals. Doha has moved up in the global rankings faster than any other city. In December 2008, Doha was ranked the 45th most expensive city for expatriates, it is now 8th. The overall cost of living index has moved up from 101 to 109, equal to that of Dubai. It is ranked 2nd for Restaurants, Meals Out and Hotel expenses, 3rd for Clothing, 7th for Household expenses (Accommodation including utilities), 8th for Groceries as well as for Recreation and Culture, and 10th for Healthcare. Denmark has dropped slightly to being the 9th most expensive place in the world for expatriates, having been ranked 3rd in December 2008. It is ranked 3rd most expensive for Groceries, 5th for Transport, and 15th for Furniture and Appliances. Hamilton in Bermuda completes the top 10 moving from 26th in December despite the overall cost of index remaining 108. Hamilton is ranked 4th most expensive for both Education and Healthcare, 10th for Personal Care, 11th for Household expenses (Accommodation including utilities), and 15th for Groceries.